ECHINODERMATA : OPHIURIDA : Ophiocomidae STARFISH, SEA URCHINS, ETC. 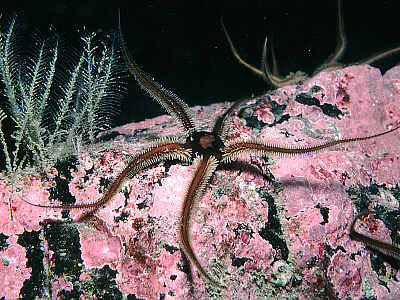 Description: A large brittle star with moderately long arms and a smooth disc. The arm spines are prominent and neatly arranged like the teeth on a comb. The characteristic colour is almost uniform dark brown or black but pale, almost white specimens occur in any population. There are five to seven long slender arm spines and a pair of tentacle scales. Disc 25mm., arms 5x disc diameter. Habitat: Usually found in moderately sheltered sites with some water movement, may form dense beds with over 100 animals to the square metre, often associated with Ophiothrix fragilis. Lives out in the open on boulders, bedrock or gravel. Tolerant of brackish conditions. Distribution: Common all round the British Isles apart from the southern North Sea. Large smooth disc, usually dark brown or black in colour. Robust arms with neat arm spines. Picton, B.E. & Morrow, C.C. (2016). Ophiocomina nigra (Abildgaard, 1789). [In] Encyclopedia of Marine Life of Britain and Ireland.